Washington has huge orchards east of the Cascades Mountains so our markets are filled with locally picked fruit for us to enjoy year round. 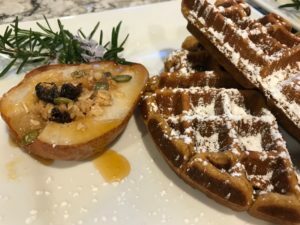 I came across this great roasted pear recipe and gave it a try and we love it and so have our guests. We would love to have you come stay with us so we can prepare it for you but we occasionally share our recipes for you to make at home. 1 tablespoon + 1 teaspoon cold butter cut into 1/4 inch dice, 2 tablespoons flour, 2 tablespoons old-fashion oats, 1 tablespoon brown sugar, 1 tablespoons green pumpkin seeds, 1 tablespoon heaping dried cranberries, 1/4 teaspoon cinnamon, 1/2 teaspoon lemon zest, 4 large firm-ripe Anjou or Bartlett pears, unpeeled, halved, cored. Preheat oven to 375 degrees. Line a baking sheet with parchment paper. In a small bowl use a fork to cut butter into flour until the mixture resembles coarse cornmeal; stir in oats, brown sugar, pumpkin seeds, cranberries, cinnamon and lemon zest. Cut a thin slice off the rounded side of each pear half so the pear will sit flat; place pear halves on baking sheet. Sprinkle 1 1/2 tablespoons crumbles topping over each pear half. Bake until crumble is golden and pears are tender, about 25 minutes. Serve immediately.